"I finally achieved my goal of running a half marathon." Jane ran her half marathon at Run Melbourne in 2017. She loved it and ran the whole way. What a legend! Our job is to create as many smiles and good vibes in your running as possible, which means that your Go Run Monthly Training Package needs to be waaaaaaaay better than a standard, one-size-fits-all online training plan. You know those plans that everybody gets offered when you sign up to an event? The ones that everyone ends up rewriting to try and make it fit with their life?. The ones that thousands of people gradually give up on, or worst of all, get injured because of. Yeah, we don't give you them. Trust me, most of us have been there and tried them. In fact most of the runners we coach have been through this exact scenario, many ending up frustrated and stressed out every time they miss a run and don't know what to do next. Your Go Run Monthly Training Package is different and better. Firstly, your plan will adapt with you as you improve and help you when life gets in the way. It is personal, real and adaptable because its written by a real and qualified coach who has talked to you about what you want to achieve, what your family, social and work life looks like and when you really have time to run. This plan includes your other activities like pilates, yoga or the gym. It actually saves you time and stress whilst adding accountability of a coach and other fellow runners who are training for similar reasons. It gives you advice from and access to an awesome network of health professionals to keep your body in tune and recovered, helping to avoid those nasty injuries that will ruin your training momentum. Our runners have actually described having their own training plan and their own personal coach as "the secret missing link" for their training and their awesome results speak for themselves! 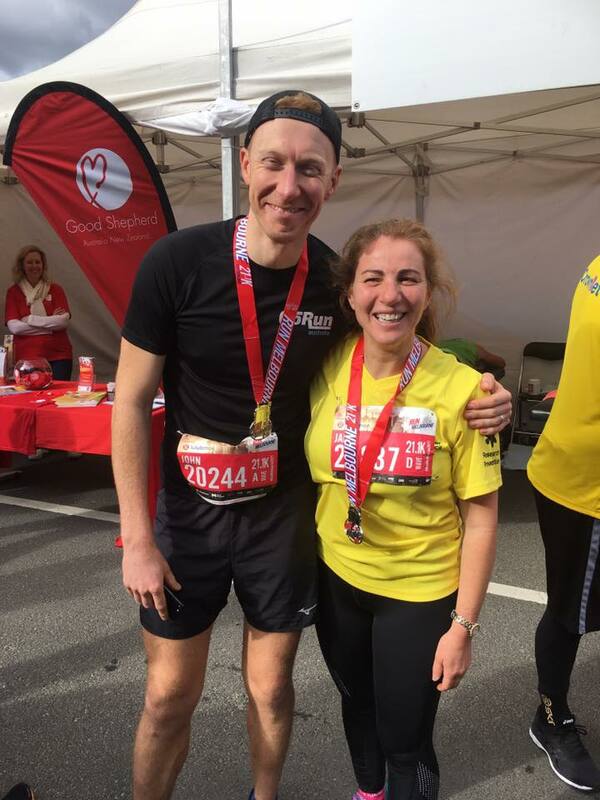 "Within five months of starting with GoRun I ran my first half marathon which I would never have thought possible"
Personalised monthly training plan designed to save you the time and stress of planning your own training. Your plan is specifically designed by a qualified Recreational Running Coach to fit in with your life and your goals, giving you structure and a sense of achievement as you tick things off each day. Unlimited correspondence with your Coach to increase accountability and keep you motivated, so you can gain consistency in your training, not get injured and go beyond those difficult times where other runners lose momentum. Unlimited GoRun Group Sessions, including our awesome monthly Guest Coach sessions. All-year-round discounts from Mizuno, Entrix Sport, GlimmerGear, Running Fit Box, Evelyn Faye Nutrition, At One Foods, Skin Strong and more of our trusted business partners. GoRun Starter Pack delivered to your door to help you get started. Exclusive education and training workshops with our awesome network of GoRun partners, specifically designed to help you improve your health and running. Private online Go Runners Community access - Share stories, progress, videos, questions and interviews with other runners to help keep you motivated! Worldwide Access to your training plan. Particularly great for those that travel and live outside of Australia. Fortnightly emails, podcasts and updates from GoRun on the real running issues that are of importance to you and keeping you up to date on discounts, partners, guest coaches, workshops and more. Yes! Give me a Go Run Training Package!